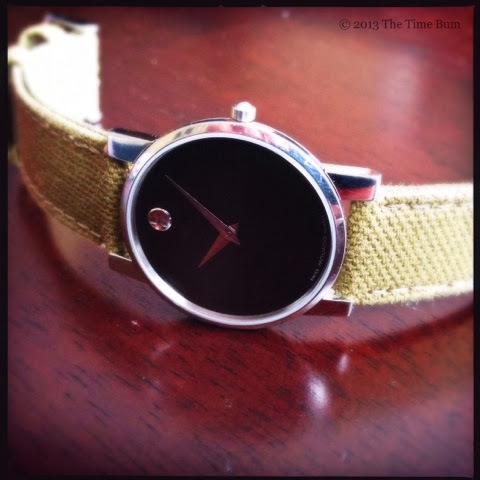 Many years ago, I bought my first quality watch, a Movado Moderna. It was the year 2000, and I knew nothing at all about watches, but I had admired the sleek, modern design of the single-dot Musuem Watch for a very long time, and I wanted one. Movado was founded in La Chaux-de-Fonds, Switzerland in 1881. It is now part of the Movado Group, Inc., an American company which also includes Ebel, Concord, and ESQ by Movado, as well as several fashion-label brands. The watches are still made in Switzerland, but those produced before 2000, like mine, have "Movado Swiss Quartz" printed on the dial, rather than the "Movado Swiss Made" of later production. Movado does not list the manufacturer, but based on the configuration and part number, mine appears to be the 7 jewel ETA 956.102. The Moderna features the classic single dot Museum Watch face created in 1947 by Nathan George Horwitt. This design, originally gold with slim pencil hands, is a staple of the Movado line and has been reinterpreted in numerous variations. I chose the polished stainless steel case model over the traditional gold as my skin reacts to gold plating like it was made of wasp venom and battery acid. 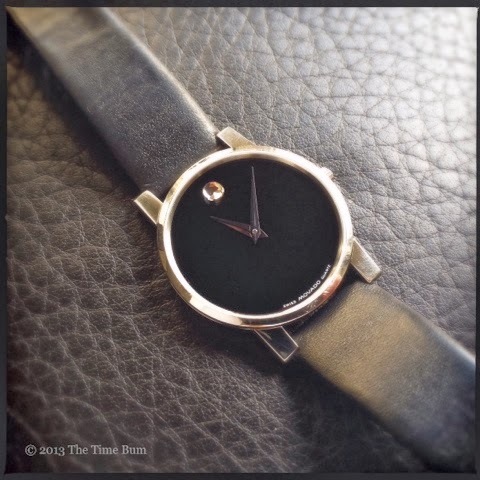 My Moderna has a glossy black dial with the trademark polished concave disk at 12:00, a detail echoed on the buckle. It has polished dauphine hands and no second hand. The case is quite small and vanishingly thin, measuring only 31mm in diameter and 6mm thick. Readability and accuracy are excellent - or at least as excellent as you can discern from a dial with no markers. 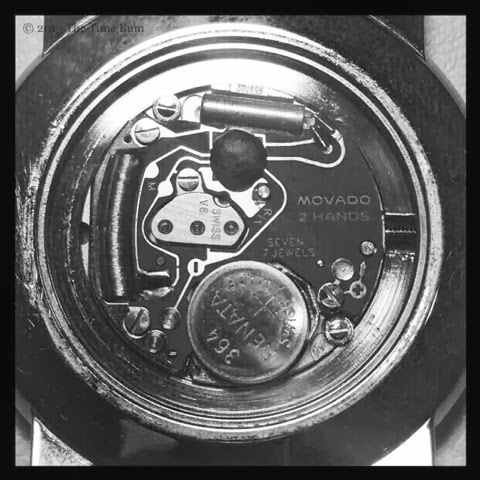 The Movado is less about split second timekeeping and more about "is it cocktail time?" Water resistance is listed at 30m, which is hardly dive-worthy but more than sufficient for a dress watch. The lugs are comparatively long and flat compared to the case, but are partially hooded with the slim leather strap tucked inside. A flat sapphire crystal protects. When I compare the hairline scratches on the case to the perfectly clean crystal, I can appreciate the hardness of sapphire. Its small size is perfectly appropriate for my 6.5" wrist, but could look like a child's watch on wrists larger than 7". The thick wristed would be better served by the 40mm Museum Watch. Unlike many of my pre-watch nerd acquisitions, it is a quality piece that has seen a great deal of wear and earned a permanent place in my collection. It is first and foremost, a dress watch. For many years it was my daily timepiece for the office. It is now the watch I grab when dressing for a black tie event. (Yes, even the Bum likes to get out now and then.) I recall designer Alan Flusser's advice in the essential menswear guide, Clothes and the Man. "Simplicity should govern the choice of jewelry for formal wear" he wrote. 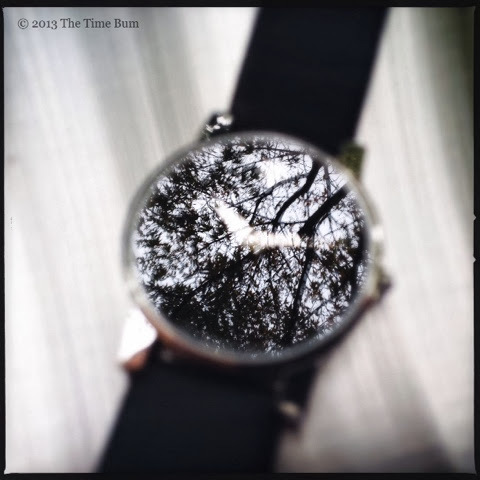 "If you choose to wear a wristwatch, remember that the thinner the watch, the more tasteful it is. Black bands are recommended." In a world of bejeweled wrist clocks, these are words worth remembering. As for those who insist on wearing your Rolex Submariners with your tuxedo, I remind you of three things: 1) you are not James Bond, 2) Bond wore his Sub with a white dinner jacket - under a wetsuit, and 3) if you can swing the Rolex, you can also afford a proper dress watch, like this maybe. I'm just saying. 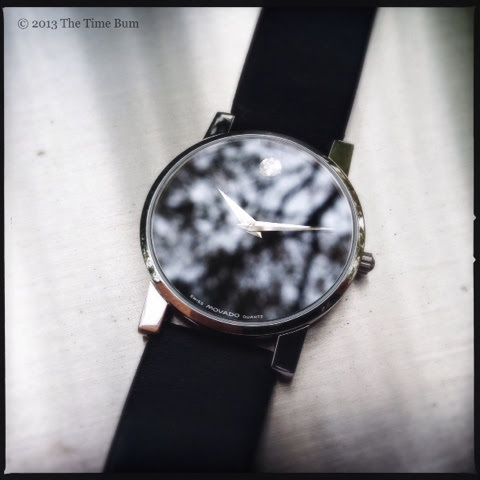 The Moderna certainly fits the bill for simplicity, slimness, and good taste. It is discreet and unobtrusive, but still distinctive with its iconic single dot dial. It is a watch that has served me well for many years, and yet... Well, let's just say that after many years together, it was time to spice things up. My watch collection has grown considerably since I got the Movado, and it had been getting less and less use. A strap change was in order, but I needed one that would fit under those lugs, and that would be a departure from the customary thin dress strap. A friend owns a more recent Movado on quilted fabric, and I liked the contrast between the sparse dial and textured strap. I wanted to push that idea a bit farther, so I went with army green canvas. I know, I know, it sounds horrible, but just look at it! 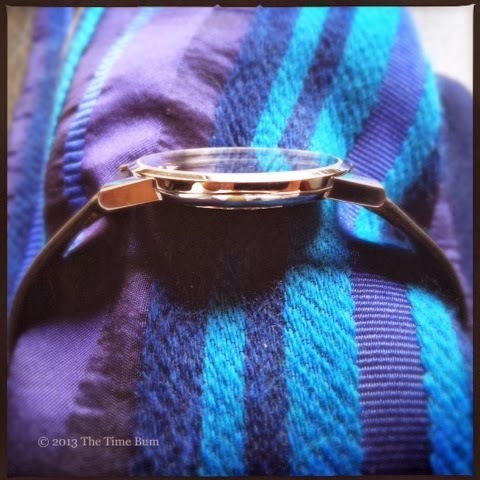 The juxtaposition of the formal watch head and rough hewn strap just works. Obviously, I am never going to wear this combination with formal attire, but I am not above pairing it with a tan summer suit and a crisp white shirt. It draws the right sort of attention without shouting its presence. My strap came off a Sea-Gull 1963, but there are other options out there. Crown & Buckle offers the well-tailored canvas Phalanx in olive, black, and beige, any of which would offset a black dialed dress watch in an attractive and intriguing way. 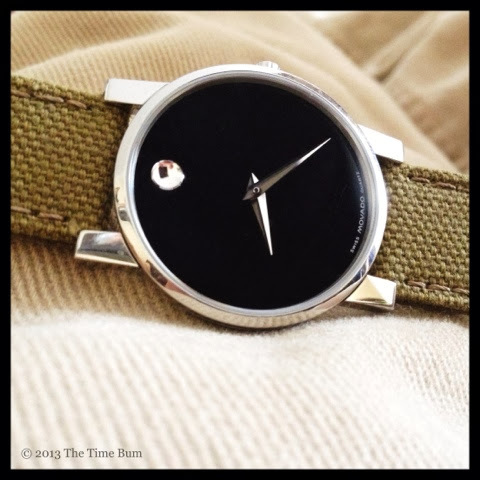 The Movado Moderna retails for about $500. Your investment gets you a well tailored dress watch that you can easily wear to the office, with black tie, and with a creative strap change will get you into the weekend as well, provided you keep things clean and dry, of course. The price is a bit steep but not unreasonable. It is also one of the most affordable examples of the Horwitt dot design. There are other, less expensive watches that fit the criteria of matching a clean, modern design with a slim case. The $191 Christopher Ward Malvern MK II springs to mind, as does the $355 Uniform Wares 152. 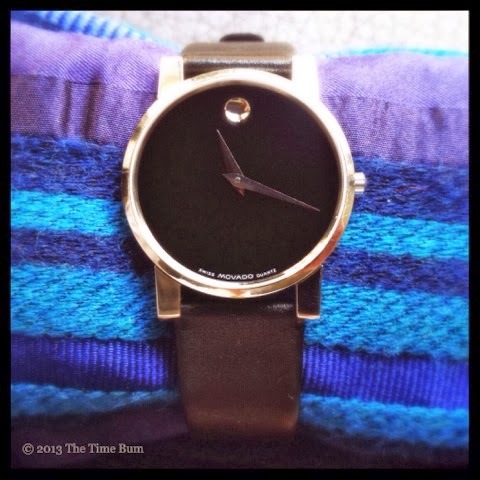 Both are attractive and attainable watches, but for those who crave the dot, only the Movado will do. Con: May be too small for some. Sum: A quality watch, and iconic design.